Keep up to date on articles, news and developments at Harvie! As I have discussed in the past, big business has noticed the success of CSA. CSA is beset with competition from alternatives for access to local, fresh food like farmers markets, grocery stores, grocery delivery concepts, and more. I covered this in more detail in my article WILL BLUE APRON (AND OTHER MEAL KIT DELIVERY) REPLACE CSA FARMS? Exactly 30 years from the founding season of CSA in the United States, I think we are at an inflection point. Anecdotally, many farms are reporting declining CSA sales, though I should note that this decline has not yet shown up in our data. Will CSA exist in its current form in 5 or 10 years? I honestly don’t know. I think it could easily go either way: CSA could grow substantially or membership may continue to shrivel. I want to make sure that CSA does thrive because I love what CSA does for farmers and for eaters — and CSA is a big part of what we do at Small Farm Central and Member Assembler! With this goal, I’ve spent the last six months digging into the research and doing 1-on-1 interviews with eaters to understand how we can reinvigorate the CSA model. Over the past couple of years, here at Small Farm Central, we have compiled the CSA Farming Annual Report and one of the most interesting findings of this report is the average retention rate of CSA members from one season to the next. In 2014 it was 45.2% and in 2015 it was 46.1%. 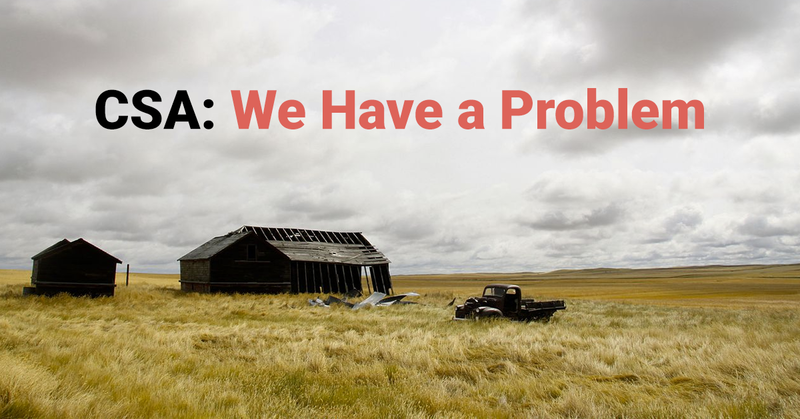 It took a while for me to recognize this as a huge issue, but I now see that it points to a profound disconnect between what a CSA customer thought they were going to get and what they got. Certainly, you will never retain 100% of your customers. People move, money gets tight, they try another CSA, but if your CSA is churning through half of your customers each year, you have a huge problem. Your business is on fire. With a low retention rate, a CSA will have trouble maintaining membership, let alone growing membership to the desired scale. To me, it is about profitability. 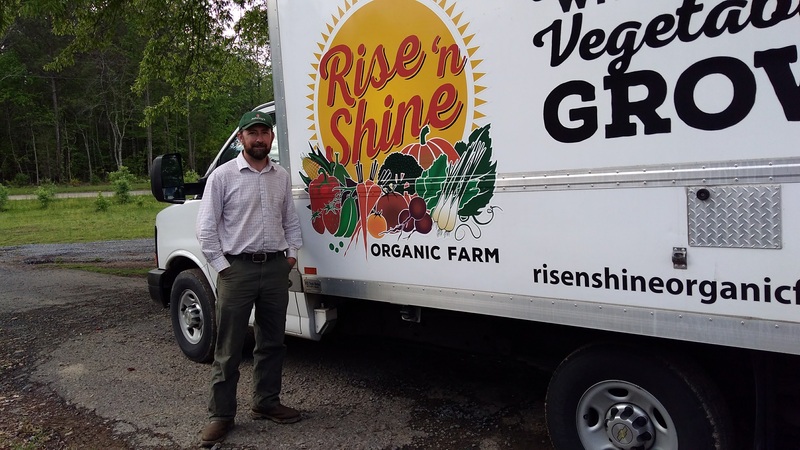 A high retention rate makes the life of the CSA farmer easier in marketing, it points to a happy customer base who will recommend the farm, and it creates conditions where farm profitability may exist. Think of this: a new member has a huge hurdle to jump to join a CSA. They need to hear about the CSA model, then they research different CSA farms in their area, then they look to see which ones deliver near them, then they need to understand the model and which share type makes the most sense for their family, and finally then they need to reach for their credit card and make a commitment. So, clearly most potential customers never get to that last step. The ones that do are fully sold and fully committed to the idea. Now they go through a full season and it doesn’t work for them for one reason or another (I’ll talk about this later in this article) and they cancel. What a tragedy for the farm and for CSA in general! We’ve lost another customer who likely will not come back to CSA. Even on a macro scale, this is a huge problem. If a household tries a CSA and they are not satisfied, they decide they will go back to the grocery store, farmers markets, try a delivery service, or buy at Whole Foods. They likely will not seek out CSA again. We’ve lost that customer. Ouch. As I’ve spent more time over the last year talking to folks about CSA, I have come to realize that in some circles, among certain eaters, CSA is known as the place where the farm dumps the produce seconds or where you’ll get a whole box of kale that you don’t know what to do with. This is not fair for most CSAs, but I’m afraid that the “brand” of CSA is starting to become tarnished. If this accelerates, we are really in trouble. However, one study from California gives me hope for these lost members: former members were asked if they would join a CSA again and 74% said “Yes”, 23% were “Unsure” and only 3% said “No”. If we want to see CSA continue to grow, we need to get a lot more customer-centric. I know a lot of CSAs are already trying to figure this out. First off, I suggest that you must talk to your customers more about why they join, why they quit, and spend the time to really understand that — don’t assume you know anything! I’ve spent a lot of time knee-deep in the university research on CSA and doing one-on-one interviews with current and former CSA members so I’ll tell you what I have learned, but there is no substitute to actually talking to your customers. You must listen to their concerns with an open mind. 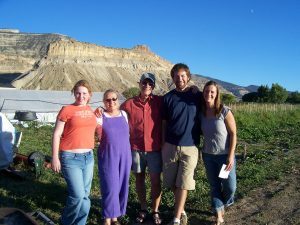 It can be really easy to get stuck in the way we are doing things now or having a producer-oriented approach — thinking, “I worked so hard to grow this food and build this farm! Why won’t people join?” But it is important to remember that everyone works hard for their money and they are buying something for themselves, not for you. A CSA farm is not a charity. What makes a CSA a CSA? Before you think about innovating on the CSA model to become more customer-centric, you need to determine what is non-negotiable in your CSA. What makes CSA special? Because key to this process is figuring out how we retain what is compelling about CSA while making it more customer centric. If we try to compete with grocery stores, I believe we always lose. 1. Direct connection between one farmer and the member. 2. The majority (> 75%?) of the share is grown on the farm. Any off-farm produce is clearly labeled as such. 3. The customer commits for the season and pays some amount ahead of time. Everything else about a CSA feels negotiable to me. Within this framework there is a lot of room for innovation and we’ve seen a lot of innovation here at Small Farm Central through Member Assembler as we work with hundreds of CSAs across the country. Lots of farms are trying to figure out ways to attract and retain customers. 4. The customer is flexible about what is in the box each week based on what is harvested from the farm. For other viewpoints on this, check out California’s legislated definition of a CSA and the USDA definition. I have been focusing my research on the CSA members that leave because these are the people that have expressed their dissatisfaction with the CSA model by not joining again. My thinking is that if CSAs are churning off 50% of their customer base each year, over time there are many more ex-CSA members out there than current members. These are people who “get it”, but were put off for one reason or another. “..you can’t just throw [the vegetables] out — or at least I couldn’t. This wasn’t store-bought produce grown by some faceless, far-off corporation. These were vegetables grown by my CSA, lovely people who packed the boxes themselves and sent emails with pictures of their farm. I felt guilty about all the spoiled produce we were throwing out. I felt a constant pressure to cook or eat our vegetables. I chafed at the loss of control over what foods we would get, and perplexed that you can have that much food in your house but nothing for dinner. In this specific case, it sounds like the CSA just gave her too much produce and this definitely does happen. The worst experience for a member is to get their CSA box, feel guilty about not eating it, let the food rot, and then throw it out three weeks later. Be careful not to think of this in too simplistic of terms: it may not have been too much food overall. Rather, it was too much of the wrong kind of food. One high retention CSA farmer told me that he looks at what sells quickly at the farmers market to know what to put in the box: if it doesn’t sell at the market, members don’t want it in their box. So why do members leave a CSA? 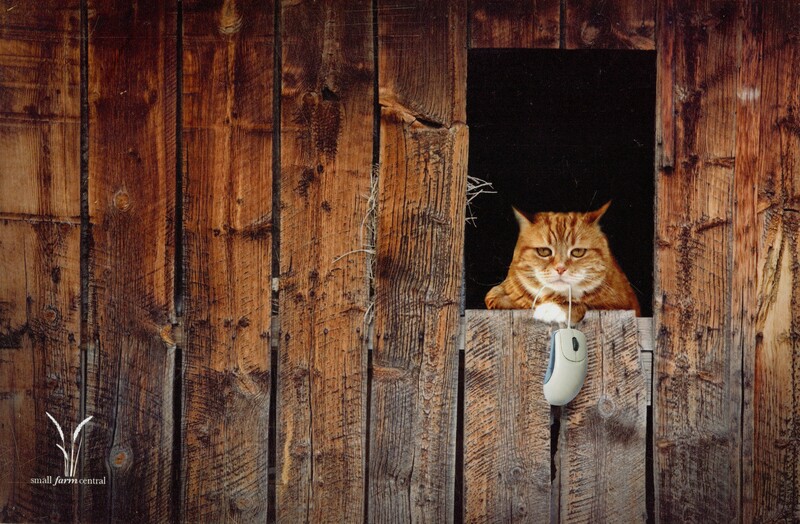 What can we do to improve retention rates? As I started my deep dive on this issue, I had theories. It’s about paying ahead. Or it’s about convenience, they want home delivery. Or it’s about wanting more choice. Or CSA is too expensive. However, I left my theories at the door and started talking to folks. In one of my 1-on-1 interviews with ex-CSA members, I talked with an 87-year-old woman who lives alone. Her main problem was that the pickup location was on a back porch with stairs and it was too hard for her to go get the share or to arrange for someone to pick it up. In addition, since she lives alone, she just didn’t eat enough produce to go through the entire box, so a lot of it went to waste. In this case, a CSA is probably not the best option for her! That’s OK! Remember, we’re not going to be able to serve everyone and we don’t need to. Or there is Kathy who lives with her husband and two kids. Her main problem with CSA is that her husband is out of town every other month for work. She loved the CSA, but when her husband was out of town, most of the box would go to waste and it did not make sense for her. Perhaps if she could pick the specific weeks throughout the summer when she would get a box, CSA would work for her. So as you can see, the problems are specific to each person’s circumstance so while there is a lot you can learn from these 1-on-1 discussions, we also need to zoom out to see the bigger trends. There is a wonderful study out of the University of California by Ryan Galt that surveyed 1,149 current and 409 former members in 2015. I think the answers are in this study! There is a lot of great data there including who buys CSA shares (gender, economic levels, and race), reasons for joining and more, so I encourage you to take a dive through the data yourself if you are interested. One really interesting point is willingness to pay: on average members said they would be willing to pay 19% more for their share. I would like to write more about value and price in a future article. However for now, my focus is on ex-CSA members because this is where I see the greatest room for growth, so I focused on the slide titled “Reasons for discontinuing”. So the top four reasons in this study for members who leave were all related to choice. This is what came up in my 1-on-1 interviews as well. People wanted the ability to choose what they liked and what they didn’t like. I looked back at my CSA philosophy and I don’t see anything in there that means that everyone needs to get the same one-size-fits-all box. Some people like cabbage and other people don’t. Choice is not part of the traditional CSA, of course. I see the standard box as a matter of convenience for the farmer rather than something that is key to the CSA model. Why does everyone need to love cabbage? That doesn’t mean that person does not support the farm any less. We just don’t have any mechanism to keep cabbage out of that member’s box and give it to someone else who loves it. In addition, the feedback that you get at the farmers market is blunted in a traditional CSA. 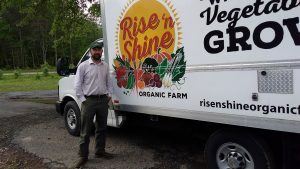 If a product is not favored by your customers at a farmers market, it’s obvious because it is what you pack back on your truck at the end of the day. In a CSA, you will likely end up hearing about it on an end-of-season survey, but the damage is already done by then and it may be easy to ignore that feedback. The product that was not favored rotted in the refrigerator and the member already has decided to shop at the grocery store or farmers market next season. So building better feedback in the CSA model is vital to improving year after year. This comes up often in my conversations with farmers when they talk about survey data: the farmer reports that one member loves green beans and another hates green beans. What do you do with that information? You can’t do much in the case of a prescribed boxed share. You need to get more flexible if you want to serve both of these customers. Alternatively, you can focus on the more adventurous customers who are happy with the box as it is. If you are able to find and retain these members, then maybe choice is not an issue for your members. A cross current to this “give them what they want approach” that came up in my interviews with CSA members is the CSA members value the adventurousness of being in a CSA program. Each week the box is a little surprise gift. It’s exciting to find out what is new and different, but there is a balance here. Too much adventure is overwhelming and the food ends up spoiling and ends with “veggie guilt” as one CSA farmer described it to me. To make it more complicated, each member’s “adventurous quotient” is going to be different. Some members will want just the basics while other members will cook everything you throw at them. All of the other reasons that members leave CSA pale in comparison to the choice issue based on my research. This is encouraging because I think we can do something about choice without fundamentally changing the nature of CSA or the growing practices of CSA farms. The issue of choice is complex because we don’t just want to give people what they know they already like — there is some chance that you can educate your members into liking beets for example. Maybe they just didn’t know how to cook them yet! Clearly, anything the CSA can do to educate members on what to do with the products in the box will go a long way. Videos, recipes, newsletters, cooking demonstrations and whatever else you can come up with! The cooking education can even turn picky eaters into adventurous ones over time. It may not sound like your job as a farmer to do this kind of education with your customers, but if you want to retain the member you must focus on their success. Especially that first season is going to be a big adjustment for members, so provide as much support as you can to your first season members. I think we can do a lot more in the cooking education end of CSA. It’s absolutely essential. There are companies out there assisting farmers with this including Local Thyme or Cook with What You Have. In technology terms, “2.0” describes the next iteration, the next generation of a technology product. I believe we need “CSA 2.0” for CSA to thrive over the next 10 years. There likely will continue to be room for traditional CSAs in the marketplace, but to grow the number of families that participate in CSA, we need to become more customer focused. We need to serve eaters better because that is what makes happy members, keeps them coming back, and recommending CSA to their social circles. I know change is hard, but I hope to be a part of modernizing CSA and helping you be profitable with your CSA. My research leads me to believe that it is fundamentally about providing more choice to members about what is in their box. There are many models out there already that provide that already. A really simple and effective method is what I term the “market style CSA” where vegetables are put out in bulk and members are to box their own share (for example, Appleton Farms describes how their CSA works). Most often the share is prescribed to make sure the farm has enough of each product but some farms just tell members to take a certain number of items or fill their bag. A trading bin can be put at the end of the line to let members trade an item they don’t like for one they will eat. Though this is more labor intensive because each site needs to be staffed, this tends to lead to high retention rates. A few years ago when I studied three of the highest retention farms that use Member Assembler, all three were employing some kind of market style model. I have ideas on how we can improve on the market style model, using customized boxed shares that retain what is strong about CSA while increasing retention. I want some feedback from farmers before I am ready to release my ideas publicly, so if you are curious about where CSA goes from here or you are looking to make changes to your CSA, email me back and let’s talk! P.S. As I look towards the future of CSA, I want to make sure I honor the past: one of the founders of CSA in the United States, Trauger Groh, died in July. 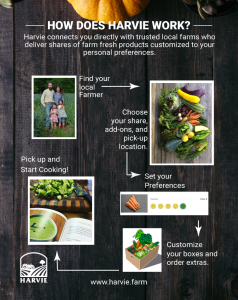 Introducing Our Harvie Farm Share + Member Starter Pack Giveaway! 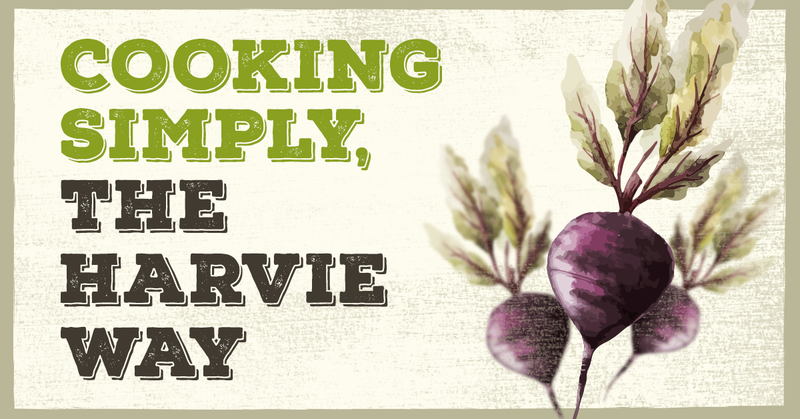 Welcome to our first ever Harvie blog post! To kick it off, we wanted to offer something extra special for all of you. Contest closes on May 8th with the winner being announced on May 9th! 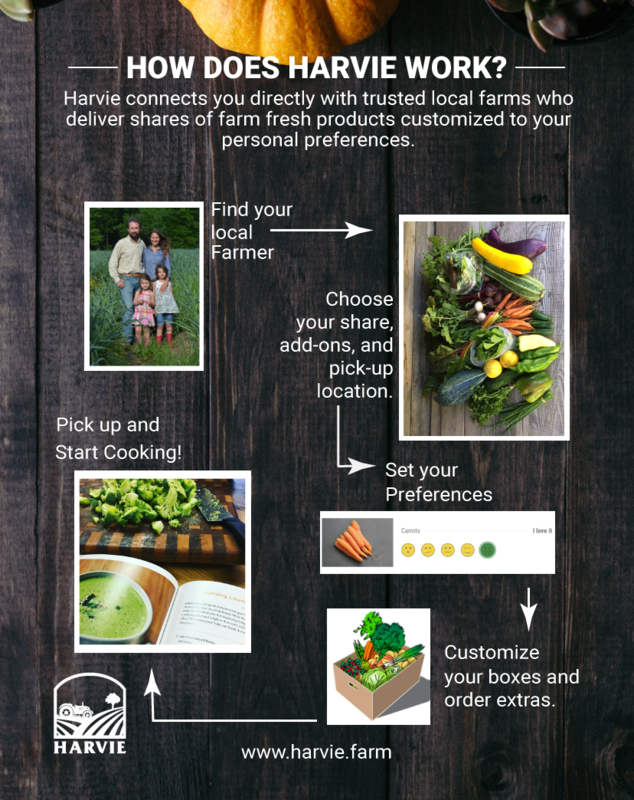 Don’t forget to let your friends and family in on how great farm shares/CSA’s can be – share with them and you’ll get extra entries for yourself! Welcome to the Harvie Blog! 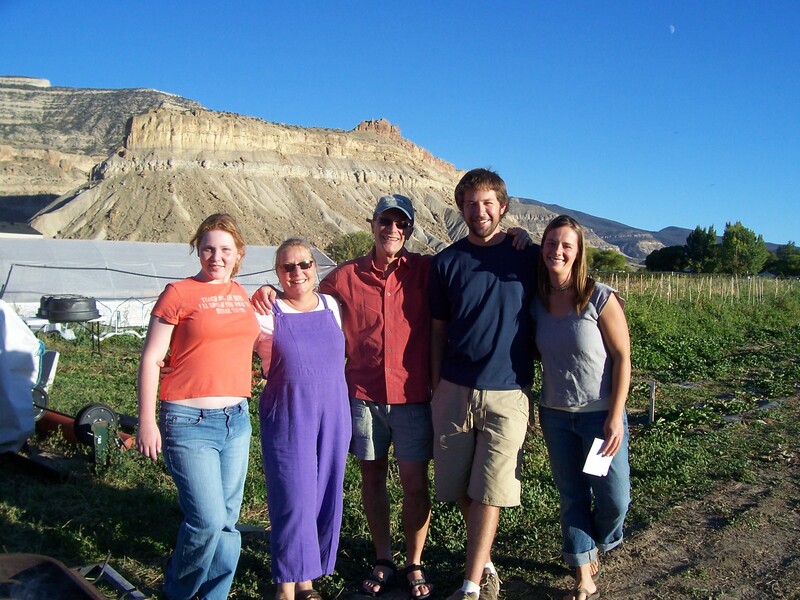 Stay tuned for fresh updates, recipes, farm share resources and other fun shenanigans!